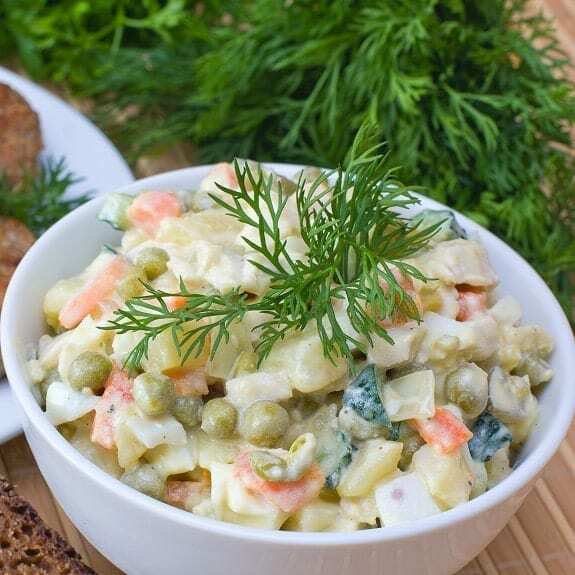 Easy vegetarian potato salad recipe. This crispy and very healthy vegetable salad served with vegan mayonnaise. Delicious! If you want to make a low-fat salad, you can substitute the dressing with Lemon Vinaigrette-very easy and simple salad dressing. Just whisk together in a medium mixing bowl four ingredients – 1/2 cup (125 ml) olive oil, 1 oz (30 ml) freshly squeezed lemon juice, 1/3 oz (10 ml) water, salt, and freshly ground black pepper. Cover and refrigerate for up to 2 days. P.S. Adding 1/2 teaspoon finely grated lemon zest, 1 teaspoon sugar, 1/2 teaspoon Dijon mustard, makes this dressing much much tastier. Instructions: In a large mixing bowl or blender cup, combine all ingredients, then, using an immersion blender, blend until smooth. Season with salt, to taste. Wrap with plastic wrap and refrigerate for up to 2 days. Use for potato salad. Variations: Addin a clove garlic will turn this vegan mayonnaise to delicious aioli sauce. Adding Dijon mustard makes this easy healthy homemade mayonnaise more delicious and less white. You can substitute canola or extra virgin olive oil for sunflower oil if desired. In a medium saucepan, steam potatoes for 1-15 minutes or until they are fork tender. Remove cooked potatoes from the pan, drain and set aside. Meanwhile, combine remaining vegetables in a medium bowl. Mix well. For the dressing: in a mixing bowl, combine all dressing ingredients. Stir well. Add colled potatoes to vegetable mixture. Mix thoroughly with the dressing. Sprinkle with chopped fresh dill and stir well.